Gargantia began with a sci-fi bent and a cleverly written juxtaposition between new and old, and culture and utility, and it’s grown into a wonderful comparison between strife and life. Ledo remains confused by the concept of culture and the seemingly wasteful traditions of the fleet for which he’s become a feature. 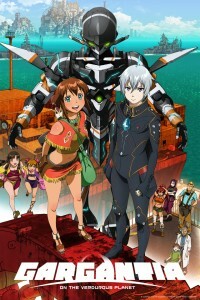 Approaching conflicts and situations with the logic of a war-honed soldier, he somehow navigates the cultural divide to strike a deal with Gargantia. The resulting chaos, involving pirates, repurposed submarines, and the terrifyingly overwhelming offense of Chamber drives home the image contrast between Space and Earth. The interesting thing about this is that the political response is far more complex than ‘yay! Our pirates are dealt with!’ – the power vacuum this creates and all the trouble associated with it is brought into play immediately, even if it happens off-screen and our journey remains focused on Ledo and Amy. Left with time on his hands, Ledo must contend with what it means to be a part of a community. Of particular note here is the contrast between the culling of imperfect beings in the colony Ledo calls home and Amy’s kind, curious, but bed-ridden brother – also, Ledo’s confusion as to the point and purpose of contact is both endearing and informative. The friendship between Ledo and Amy grows with each episode as they teach each other about their lives – Ledo is softened by Amy’s determined integration of the Space man and Amy’s curiosity is stoked by Ledo’s willful discussions. We learn about Earth and its many wandering fleets and electrical storms in tandem with Ledo’s much more sterile, brutal… and in the face of Gargantia’s culture, one might even say sterilized, background. All in all, Gargantia has remained strong and continues to promise a fulfilling, enjoyable story full of thought-provoking contrast and entertaining escapades.